As a busy adult, you have a professional image you’ve worked hard to cultivate. But if you’ve been considering braces, you may be worried that you’ll have to sacrifice that image. The good news is that’s not the case at all. With Robison Dental Group, patients from Canton and surrounding areas can enjoy a straighter, more attractive smile with Invisalign clear braces. As one of the most popular and effective cosmetic services available, Invisalign uses a series of custom-made acrylic aligners to straighten teeth. To treat your smile, you’ll simply wear each pair for about two weeks. As you move from one pair to the next, your aligners will gradually bring your teeth into their ideal alignment until you reach your goal 12-18 months later. Because Invisalign’s aligners are clear, you can finally achieve your goal of a straighter smile without drawing negative attention to your teeth. But there’s also another benefit to Invisalign—your aligners are removable. First, because you can take them out for special events, like a party, a dinner with friends, a special meeting at work, and so much more. 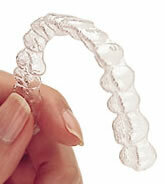 But even greater than this, because your Invisalign aligners are removable, you can take them out to brush and floss. This is one of Invisalign’s greatest advantages over traditional braces. With traditional braces, the presence of brackets and wires can make it difficult to keep teeth clean, which can result in tooth decay and other problems. But with Invisalign, you can remove your braces to brush and floss, giving your smile the thorough cleansing it needs to stay strong, healthy, and beautiful. Are you ready to find out more about how Invisalign can help your smile? Give Robison Dental Group a call. Our doctors are happy to help patients from Canton, Ann Arbor, Northville, and Plymouth with Invisalign clear braces. Get in touch with us today!